When a right-sided trocar site coincides with the desired stoma site, the trocar site is extended 4.5 cm. The specimen is retrieved. The color-coded ureteral holding sutures are identified. 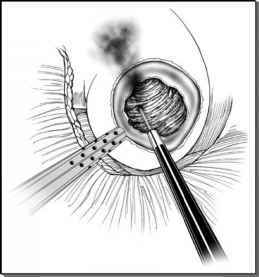 A 65-cm segment of ileum is selected with care to spare the 15-20 cm proximal to the ileocecal junction. The mid-portion of the segment should reach the urethral stump without undue tension or mesenteric kinking. The segment of bowel is delivered through the incision and isolated with a GIA stapler by transecting prox-imally and distally. The mesentery is divided below with care to preserve the major mesenteric vasculature. The isolated segment is dropped posteriorly.